Fifty miles northeast of Orlando and 242 miles northwest of Miami, Daytona Beach is one of the largest cities on Florida’s Fun Coast with so much to do: fresh seafood and tropical cocktails, annual festivals and events, museums and botanical parks, outdoor recreation, nearby golf, shopping and sensational beaches. Stop by Guest Services for personal recommendations and local tips to help you get the most out of your stay. The park features interactive water fountains, lush walkways, shaded playgrounds, picnic tables, and more. The Daytona International Speedway hosts a series of annual events and races and offers track tours. ‘The Loop’ is just over 30 miles long with unobstructed views of rivers, creeks, marshes, barrier island dunes and beach, and historic dwellings. A hardwood hammock forest canopies the road. A little over an hour from Daytona Beach, the Kennedy Space Center is an interactive and educational experience (check out Lunch with an Astronaut); bus tours are offered. 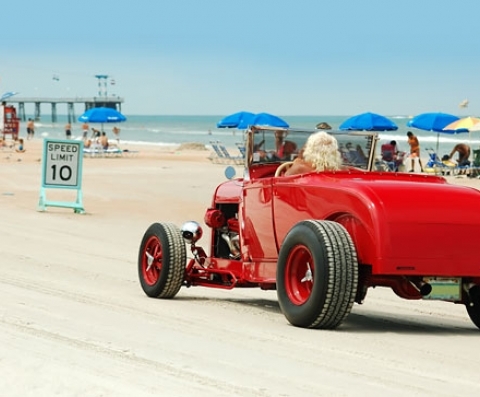 Take A1A from Daytona Beach north to St. Augustine and enjoy long stretches of untouched beaches and scenic views. While there, take a trolley tour; also grab a bite at one of their gourmet bistros or cafes. Down South river cooking. Fresh seafood, ribs, and drinks on the Halifax River. Play a round of golf and then snack on the burgers, BLTs and Club sandwiches from their on-site grill. Daytona’s oldest independent theater. Showcases art films while serving casual food and drinks. Enjoy a ‘50’s theme and what some say is the best breakfast in town. Sleek but cozy restaurant with a menu of sake, sushi and other Japanese food selections. Opened in 1940, this waterfront 3-story spot offers seafood, burgers and a reggae bar with live music. High-end steakhouse serving grilled meats, seafood and cocktails in a sophisticated setting. An 18-hole par 71 course, Riviera was named one of Golf Digest’s “Best Places to Play” 2008-2009, and is home to the longest running Mini-Tour event in the country. Indigo Lakes is an 18-hole par 72 course designed for players of all skill levels. Wide fairways and smooth rolling greens make this 18-hole championship golf course a standout. Players can expect a generous practice putting green, a chipping green and driving range. LPGA International features the Hills Course and the Jones Course, both considered distinct in design. Golf Digest rates them as four-star courses. Nestled in a lush canopy of century-old oaks, Halifax is considered one of the most picturesque courses in Central Florida. A semi-private 18-hole course with one of the toughest, and perhaps the best, conditioned course in the area. The lush 10 acres of these botanical gardens include an Audubon trail and is home to stunning ancient trees, shrubs, exotic plants and flowers. An historical landmark, the Lighthouse is the tallest in Florida and visited by over 170,000 people each year; see its collections and exhibits as well as incredible views from the top of the tower. Experience the solar system and a night sky tour from a live presenter in an immersive 360-degree environment using their OmniStar™ projector; inside the Museum of Arts & Science. A family-friendly water park with a wide range of activities including water slides, go-karts, mini-golf, an arcade, laser tag, and a rock-climbing wall. This world famous racetrack is home to NASCAR events, including the Daytona 500, Coke Zero 400, and more. The Daytona Beach Pier & Boardwalk offers a wide range of indoor and outdoor amusement rides, gift shops, restaurants and live entertainment. This 116-acre, 500-animal zoo and botanical garden is located just south of Daytona Beach. View ruins of the former plantation, a sugar mill, and slave cabins. The 150-acre park is listed on the National Register of Historic Sites. Head to South Beach Street Historic District and Riverfront for shopping, dining, antique shops, museums and more than 150 historic buildings. A modern, open-air mall, Tanger is home to 75 brands and designer names at outlet prices including Michael Kors, Under Armour, Vera Bradley, J. Crew, Nike and Banana Republic. The Pavilion is an outdoor shopping center with shops, dining, walking trails by the water, a play area for children, water fountains and a movie theater with 14 screens. With stores ranging from T.J.Maxx to Pier 1 Imports, Volusia Square offers another shopping destination on the Boulevard. Located across the street from Daytona International Speedway, Volusia Mall is an indoor shopping center, featuring a wide variety of shops, dining, and entertainment. Bellair Plaza is the largest beachside shopping center in Daytona Beach with a supermarket, specialty shops, department stores, restaurants, and a bowling alley.